Author: Neil Skinner †. Series edited by: Herrmann Jungraithmayr, Norbert Cyffer. 32 pp. Roman, 339 pp. This work has approximately 400 pages: Introduction and Bibliography, 36; Hausa-English and comparative data, 300; English-Hausa Index, 40 pages. Its purpose is to make suggestions about the etymology of a large number of frequently used words, ranging from those where it is 99 percent certain – e.g. some loans from Arabic or English – to others which have intriguing possibilities, forming a basis for further research. Comparative evidence is taken from between two and three hundred other languages from all major African language groups except Khoisan. Where relevant, reconstructions already suggested by other scholars are quoted, including those of the recent Hamito-Semitic Dictionary of Orel and Stolbova. Neil Skinner was a Professor Emeritus of the University of Wisconsin, Madison and had published two earlier dictionaries of Hausa, and a number of articles on the lexical relationship between Hausa and languages connected with it, either geographically or historically. 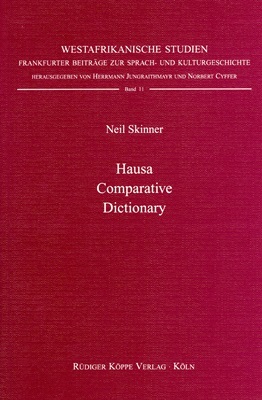 This dictionary is the latest work by Prof. Skinner, who 'has been interested in Hausa words for 53 years' (p.vii) and whose production is very large. [...] It is a great pleasure for me to see the work accomplished, being one of the various scholars, who received the earlier parts when it was in progress. Since that time I appreciated the great mass of data, collected from a long list of publications consulted (see Select Bibliography, pp. xxii-xxxi). When the author says: 'The work, as it stands, is not an attempt to reconstruct a proto-language, but to make available in one place data from other scholars to consider, and then reject or use, when they have brought their own areal expertise to bear' (pp.x-xi) in a certain way his work is a first step towards a reconstruction, because it is so important for Hausa studies, and not only for them, to stimulate a discussion for a Hausa etymological dictionary.